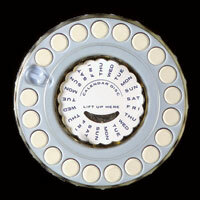 The world’s most recognizable birth control method, the Pill, turns 50. The poor, mostly uneducated women who lined up in San Juan, Puerto Rico, 50 years ago didn’t know they were participating in the first large-scale clinical trial of a medication. But they did know the pill they’d been asked to try promised an amazing benefit: Taken properly, it would prevent pregnancy. Soon to be known simply as the Pill, the first oral contraceptive was developed by Gregory Pincus, an endocrinologist, and John Rock, a gynecologist. But the idea had originated almost four decades earlier, the brainchild of birth-control activist Margaret Sanger. By the time Sanger met Pincus in 1951, scientists had discovered the role of progesterone in repressing ovulation in pregnant women. When she persuaded him to pursue a birth-control drug, he imagined a pill that would mimic progesterone’s effect in women who weren’t pregnant. By 1953, Pincus and Rock had settled upon progestin, a synthetic version of progesterone, as the Pill’s active ingredient. A small trial proved the drug’s effectiveness, but finding a site to conduct the large-scale trials necessary for regulatory approval was another matter. Thirty states had nineteenth-century laws banning even dissemination of birth-control information. But in Puerto Rico—struggling with poverty and rapid population growth—officials welcomed the trials. Seventeen percent of participants, taking pills that contained much higher doses of hormones than are used today, reported nausea, headaches and other discomforts. Pincus and Rock concluded that these symptoms were largely psychosomatic. More notably, not one participant became pregnant. The Food and Drug Administration (FDA) approved a formulation, Enovid, in 1960, and within two years a million women were taking it. Contraceptive formulations now contain lower hormone levels that minimize the risk of heart attacks. But more revolutionary changes are in store, says Regine Sitruk-Ware, a reproductive endocrinologist at the Population Council in New York City. Researchers are developing molecules that prevent conception by tweaking an enzyme in sperm cells so they won’t bond to eggs. Such methods are 15 to 20 years from the market, says Sitruk-Ware, but within five to seven years the FDA could approve a male contraceptive that suppresses sperm production. As men age, genetic mutations in their sperm multiply, raising risks for their offspring. Lacking a standardized test to assess a baby’s health at birth, anesthesiologist Virginia Apgar created a simple rubric that persists more than a half century later.